Days before the Miss Earth 2016 press presentation, I had the privilege of meeting several Miss Earth 2016 candidates including the eventual winner, Katherine Espin of Ecuador. Among the delegates, it was Katherine who left an indelible impression. “Oh, you are from Missosology,” she beamed when I introduced myself. “I have to take a selfie with you! 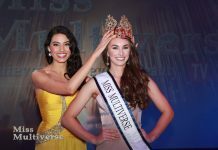 Missosology is famous in Ecuador!” Whether it was genuine or merely a form of flattery, it was at that point that I discovered the magnetic and beguiling personality of Katherine. She is, simply put, a charmer! Katherine is proficient with the English language and that gave her an edge. It helped her big time. Katherine served as my interpreter in conversing with other Latina delegates. In the most crucial part of the competition, her English language skills came in handy as she delivered her answer. The content (and the fact that she didn’t have to use an interpreter which, at Miss Earth could go horribly wrong) made Katherine’s answer a runaway hit. Pageant analysts concede that the final question and answer was the tipping point and it was the moment that handed the victory to Katherine. Katherine Espin displayed a pleasing form of confidence. I can see right away that confidence inside her. She has a positive and a winning attitude. Her vast experience in international competitions albeit on minor pageants, helped hone such kind of character. I expressed strongly my opinion to our in-house pageant analysts to keep an eye on Katherine as I had a gut feeling that she could be the next Miss Earth. In the last stretch of the contest though, days leading to finals night, many negative reports came in. There was one particular rumor that was put out there, that true or not, unless there is compelling evidence, should not have been entertained because of its ruinous nature that could affect the image of beauty pageants in general. But there are other bad rumors that dragged down the ranking of Katherine Espin at our Hot Picks. Some even floated the idea that she could end up as “If Only She Were There…” girl. Katherine Espin’s beauty was very prominent till the last moment of the competition. It was easy to see why she won. She possesses a curvaceous body. She’s witty, intelligent in fact. She was also absolutely correct in tapping Leo Almodal to design her final gown (which, by the way, generated another nasty story which requires a separate article). Katherine won fair and square but it was a hard-fought competition that produced a lot of bitterness to those who lost. As the dust settled, Katherine Espin’s victory got tangled with some controversies. It is however refreshing to see her handling all the negativity with such class and grace. There is no question about her victory but is was indeed sad to see some of the losers and clappers rain on her parade. It shouldn’t be this way but then again, these days, you can’t be a real beauty queen without a few haters.